April 2019 – Exclamation Points! 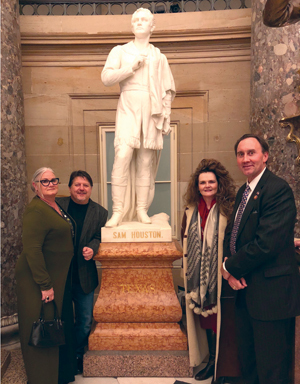 Leslie Woods and Tim and Patti Kaminski hopped to Washington, D.C. and enjoyed a tour of our nation’s capital with Congressman Pete Olson. Special thanks to Congressman Olson! The month of April brings us so many wonderful things: the showers that bring May flowers, the beginning of longer days with cool nights perfect for taking road trips and the most holy of observances for so many – Easter. In this issue, we are springing forward with some eggcellent tips for Easter, a story that will motivate you to spring forward and some great road trip destinations! First, it’s time to dye those Easter eggs, and we bring you some unique ideas to make your eggs – and brunch table – eggstra special. We also bring to you a gentleman who has a spring in his step after receiving outstanding care at Houston Methodist Neuroscience & Spine Center at Sugar Land. Greg Herring’s back pain made springing forward difficult, but the team at Methodist’s Neuroscience & Spine Center at Sugar Land got him back to hopping, and best of all, without surgery! Speaking of hopping, spring is the perfect time to hop across the state for a road trip. In Globetrotting Across Texas on page 34, Alisa Murray shares the top 20 Texas hotels perfect for a weekend jaunt. As we prepare for Easter Sunday – and yes, my 270 month-old and my 239 month-old babies still receive Easter baskets – we wish you and your family bles-sings on this most holy of days.